Pro-life groups are calling on vulnerable Democratic senators to advance President Donald Trump's nominee, Brett Kavanaugh, to the Supreme Court. Kavanaugh cleared the Senate Judiciary Committee on Friday on a party-line vote, a day after Christine Blasey Ford testified that the D.C. Appeals Court judge sexually assaulted her when both were at a high school party. Kavanaugh has categorically denied the charge and every party attendee Ford has named has denied or sworn under oath that no such event occurred. Pro-life groups are now calling on the Senate to move beyond the committee hearing and confirm Kavanaugh to the nation's highest court. "It is time for the full Senate to confirm Judge Kavanaugh immediately," American Family Association president Tim Wildman said in a statement. "Despite the sleazy tactics used against Judge Kavanaugh, he has weathered the storm." Kavanaugh, who has cleared multiple FBI background checks, has objected to further delays on his nomination and reiterated his innocence during Thursday's hearing. Senate Republicans had hoped to vote on Kavanaugh's nomination over the weekend in order to replace retiring justice Anthony Kennedy before the Supreme Court resumed activity on Monday. Those plans may be disrupted by retiring Arizona senator Jeff Flake (R.), who said he wanted a one-week delay on the vote in order to conduct an FBI investigation. "We ought to do what we can to make sure we do all due diligence with a nomination this important," Flake told reporters, adding that any investigation should be "limited in time and scope." Senate Judiciary chairman Chuck Grassley (R., Iowa) has said an FBI investigation is not needed in light of Blasey-Ford's inability to provide corroborating evidence. Such a review by the nation's top law enforcement agency would only repeat inquiries pursued by committee investigators. Pro-lifer advocates support Grassley's determination. Terry Schilling, executive director of the American Principles Project, said any investigation should focus on providing factual support to Blasey-Ford's claims. Ford could testify under oath about the details of the location, time period, or other supporting facts about the party where she was allegedly assaulted. Schilling said any investigation should center on substantiating the assault allegations using evidence, and senators should base their votes on the truth, rather than he-said-she-said allegations. "If they cannot find any direct corroboration of the present allegations by next Friday, then that should be the end of it, and it will be time to vote," Schilling said. The Susan B. Anthony List, which supports pro-life female candidates for office, has also thrown its support behind Kavanaugh. President Marjorie Dannenfelser said red state Democratic senators will face a hostile electorate if they oppose the appointment. The announcement came as Indiana Democrat senator Joe Donnelly said he would oppose the nomination. 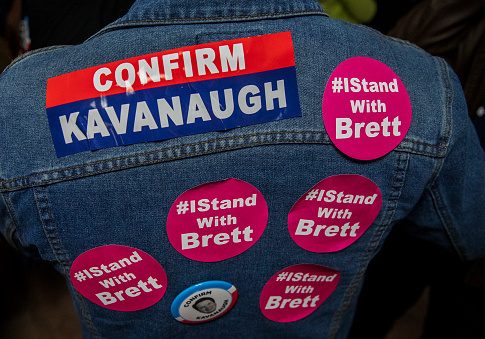 "Vulnerable senators up for reelection should not underestimate grassroots support for Judge Kavanaugh and frustration with the tactics used to obstruct him," Dannenfelser said. "They ignore their constituents at their political peril. It is time to end the politics of personal destruction." Conservative and pro-life activists have zeroed in on Donnelly and other red state Democrats who have refused to commit to backing Kavanaugh. Polls commissioned by conservative groups have found a majority support the nomination in hotly contested states, such as West Virginia and Arizona. Judicial Crisis Network founder Carrie Severino, a former clerk for Justice Clarence Thomas, has spearheaded a multimillion-dollar ad campaign to confirm Kavanaugh and fellow Trump appointee Neil Gorsuch. She said in a statement that Democrats face a clear choice in the Supreme Court vote about whether they "stand with Chuck Schumer and his smear campaign or stand with the people … who overwhelmingly support President Trump’s extraordinarily qualified nominee Brett Kavanaugh." The Supreme Court will begin its fall session on Monday. This entry was posted in Issues and tagged Abortion, Brett Kavanaugh. Bookmark the permalink.